Move over Saturn! Scientists have found a ring around an unassuming mini-planet in our Solar System to debunk the theory that only giant planets can be so adorned. The planet, dubbed Haumea, orbits the Sun far beyond Neptune—the eighth and furthest recognised "full" planet in our star system since Pluto was downgraded to dwarf status in 2006. About eight billion kilometres (five billion miles) from the Sun, Haumea spins rapidly on its own axis, and has a flattened, cigar-like shape. It takes 285 years to circle the Sun. Named after the Hawaiian goddess of childbirth, it is among a handful of known dwarf planets beyond the orbit of Neptune, which with the other so-called giant planets—Saturn, Uranus and Jupiter—all have rings. "Our discovery proves that there is a lot more diversity and imagination in our solar system than we had thought," study co-author Bruno Sicardy of the Paris Observatory told AFP. A ring system had previously been discovered around a centaur dubbed Chariklo. 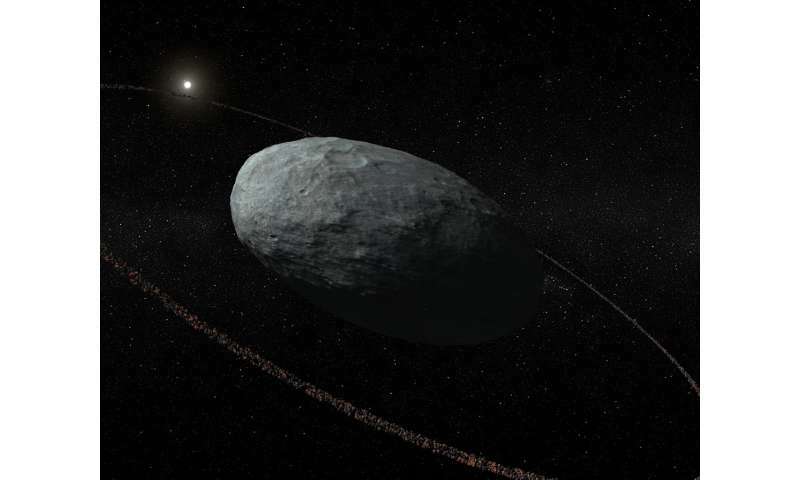 Centaurs, which have unstable orbits, are considered large comets, not planets, which means this is the first observation of a ring around a dwarf planet. The new discovery came when Sicardy and a team predicted that Haumea would cross in front of a specific star, from Earth's perspective, on January 21 this year. They trained 12 telescopes at 10 different laboratories on the spot, and were able to measure many of the physical characteristics of the little-known planet discovered in 2004. Scientists can infer much about a planet's density and size by how much light it blocks out as it moves in front of a star. In Haumea's case, they found it sported a dense, Saturn-like ring some 70 kilometres wide, made of frozen particles. The planet has two moons. 3. The existence of a ring is not related with the mass of an object and its speed of rotation." "Why there is a ring, an asteroid belt or a disk around the celestial objects?" This is the 12th known planet of the Sun, using a strict geophysical definition and using semi-major axis to determine order.